Sendy is not a complete solution for your email marketing task. To use sendy, you need server to host sendy script, email sending service/server and a domain. 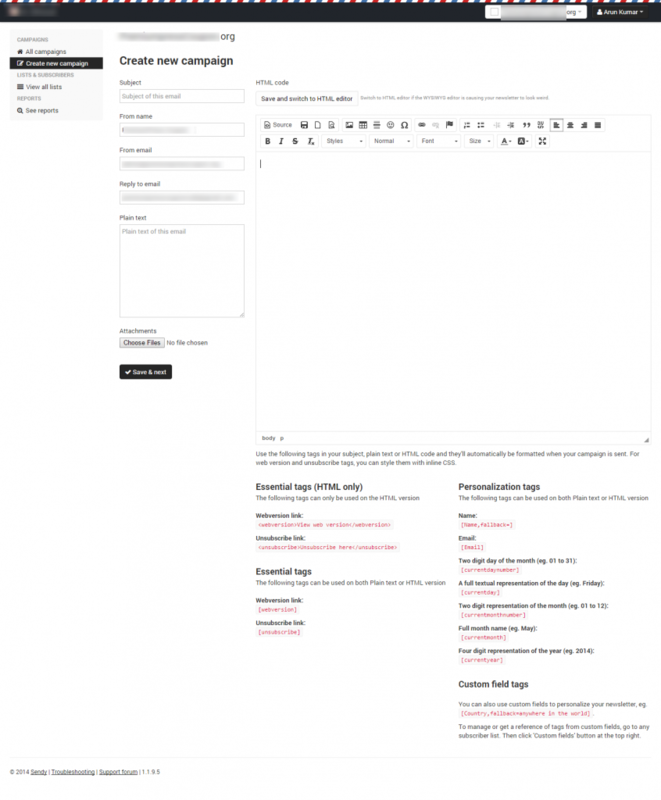 Before getting my hands on sendy platform, I tried Aweber and MyMail wordpress Plugin. I like both the service, but both of them won’t properly suits my needs. Here why I moved away from Aweber..
1. Cost: Aweber is hosted email marketing platform which offers very nice features, but when it comes to the cost-it is pretty costly, and it’s recurring too. As per my business needs Aweber seems to be pretty costly, moreover I rarely used to send newsletter to my subscribers. So aweber is not a right solution for my business needs. 2. Scalability: Aweber is good for users with small subscribers list, if your list start growing then you will end up paying more than your website server cost! so in the long run aweber won’t be perfect solution at all. To give you an idea, If you have 5,001+ subscribers in your list then you have to pay $69 monthly to maintain that list whether you send mails or not it won’t matters. 3. Use it or not, you have to pay full: This is the one features which I don’t like about aweber. I’m not a regular email sender, but still we need to pay full amount for maintaining that email list. These are the few things which I don’t like about aweber. I mentioned aweber here because I used only this service. It usually apply to all most all hosted email marketing solution. After trying Aweber I did lot of research online to find solution to my newsletter problem. The solution that I found is, MyMail plugin. 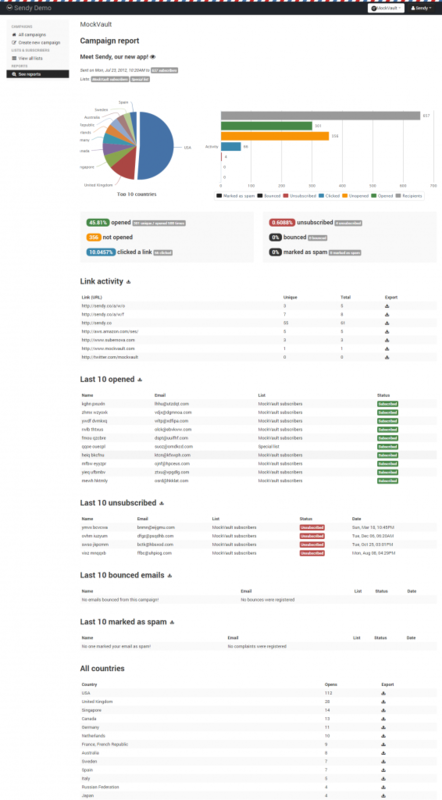 When I came across this MyMail plugin, I immediately bought and started integrating on my wordpress blog. 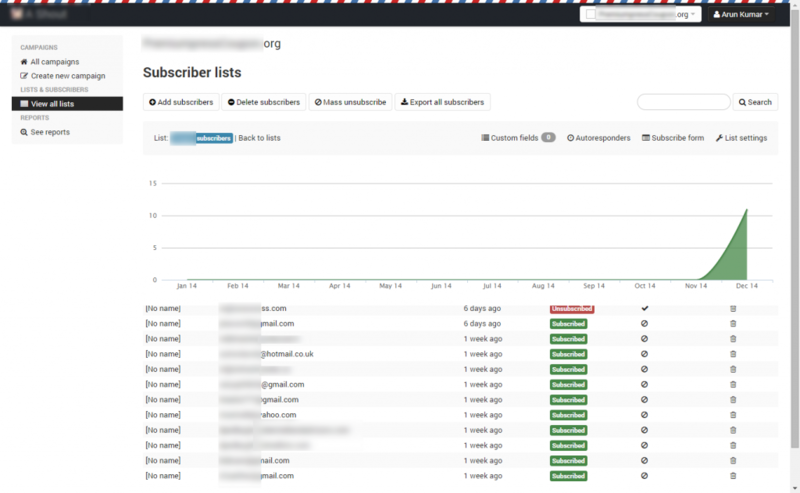 MyMail plugin is really a nice plugin, and it is also having lots of features. I really loved it until I started facing some problem. The problem that I faced with MyMail plugin is, It stopped handling bounce and complaints. I did not noticed that MyMail is not handling any bounced email address until I got mail from Amazon SES saying-your account has been suspended due to high bounce rate. That’s the time I realized their is a problem with MyMail plugin in handling bounced mail. I contacted developer regarding this, and he also failed to fix the problem. It happened because, MyMail uses Gmail account to handle bounce and complaints, and Gmail recently introduced new security feature which is stopping MyMail plugin to login to Gmail account to handle bounce and complaints. That’s the time I started looking for other solution. The next solution that I came across is Sendy. When I started using sendy on my domain the first thing I noticed is, very nice user interface, little setup required to get started into the system and light weight script. After using sendy newsletter script with Amazon SES, this is what I feel about that script. The first thing that I love about sendy is-its design. Sendy script comes with Awesome user interface, you don’t find any much complicated option, colors with this script. I simply love that minimal design. As I said earlier, before I start using sendy I was with Aweber. When I was with aweber my expenses are like 69$ Per month to maintain that list, and Now with sendy my cost went to $1 Per month, that too If I send newsletter or else I could save that money too. For your information, I never calculated Server (I use Digital Ocean) and Domain cost here because I hosted sendy on the same server where my other domains are hosted. Some email marketing company have some strict rules regarding email list. For example, some companies won’t allow you to bulkly import your email list. Your list is always in control of someone else, you have to obey their rules or they will kick anytime. When it comes to Email marketing you should take care of handling complaints, bounce and Spam complaints very seriously or else your newsletter won’t reach your subscriber inbox. Sendy is primarily designed to work with Amazon SES, and they are using Amazon HTTP protocol notification method to receive such complaints. Once sendy receives any complaints it automatically handles it. For example, If you got Hard bounced notification then sendy marks the email Has Bounced email ID and in future it won’t send any email to that user. Thus you can maintain good email list. Few services like MyMail plugin need one separate Gmail account to handle such complaints. I strongly disagree with this type of method. Because of this and few other features made me to switch to this service. When I was using MyMail plugin, building List for different domains is really a tedious process. By that plugin also you can collect email IDs from different domains as well, but there are lot of difficulties involved in that. If I start mentioning here then it will be another big post. So I will avoid pointing all those here. With Sendy, You can easily collect email leads from as many domain as you want by installing sendy on only one domain. It will be very easy to manage all your list under one roof then installing domain specific Plugins like MyMail. Think that you have 10 Domains, and you will install any newsletter plugin for all those 10 domains to collect email IDS. If you go with premium plugin then you may need to buy a separate licence for each domain. Moreover, if you need to send newsletter to any of those 2 domains then you need to go to specific domain, then login to your site, go to plugin page and create new campaign. It take some time to do all those steps. How about managing all those different Domains Newsletter task under one roof? sendy perfectly suits for this job. Previously I installed newsletter plugin on each domain and I was spending most of my time just navigating here and there to schedule newsletter. After moving moving to sendy, my newsletter task is managed all under one roof. This feature really helps a lot for most of them. In some cases we need support. Sendy is developer is offering excellent support through Sendy Forum and by mail as well. Most of your queries are answered by developer within 24 hours. I love their support. Sendy is a beautiful email marketing script, but it still missing some important feature in it. Below are the list of feature which I felt it was missing on Sendy. Sometimes we may miss adding Unsubscribe link manually on every mail that we send. I think developer should make sendy to alert when we try to send newsletter without Unsubscribe link. I think this is one of the main feature which is currently lacking on Sendy script. Currently sendy don’t come up with newsletter template support in it. If you need add template in sendy, then you need to Copy paste the html code on editor. Sendy is built to use it with Amazon SES. If you wish to use sendy with other provider like mandrill, then sendy won’t support to it. You can use sendy with Mandrill as well, but the problem is sendy won’t handle bounce, complaints. If you are a blogger then you might miss this feature a lot. Currently sendy won’t automatically compile our latest blog post and send it to our subscribers. Below are the list of features currently you can find on sendy.co php script. In sendy brands is nothing but different domains. Which means you can collect email subscribers from different domains by creating separate brands here . Currently I used to create to different brands per domains. For example, I created SendyReview.com as one brand to collect email leads from this domain. This is how multiple brand feature is going to work in sendy script. This is really nice feature. By using this feature we can easily collect and manage all email list at one place instead of installing sendy for each and every domain. Sendy allows you to add your clients to send newsletter. You can use this option by clicking on “Edit” link on Brands page. This feature might not be helpful for everyone, but definitely it will be useful someone who manages clients. In client manage page you can provide the client login email id, password, campaign Fees, set monthly limit and other option here. All the payments made by your clients will directly sent to your paypal account. Sendy allows you to create multiple list for each brands, by this way you can build as many email list as want for that particular brand or domain. For example, If I created SendyReview.com as brand, in that brand I can easily create Blog subscribers as one list who receives all blog post updates and special offers alert as one more list where users only receives special offers alerts. Both the list will have different subscription form to collect subscribers. This is how you can make use of different list in sendy. If you wish to see more information about that list, then just click on that list name. It will take you to the detailed stats about that list subscribers. Here you can import all the subscribers to list, delete any subscribers, mass unsubscribe users or you can also export all the subscriber easily as well. Need to collect More information from subscribers? then you can make use of custom field option which comes under list. Here you can create as many fields as you wish. For example if you wish to collect your subscriber Date of birth, then you can do it by using this option. If you need to send Autorepsonders for any particular list, then you can set by going to that particular list and by clicking on that Autoresponders option. Here you will get the subscribe form which you need to place on your domain to collect subscribers. Just copy that html code and paste it on any web page to start collecting subscribers. In List settings you can enable whether that list should have single opt-in or double opt-in, you can also configure subscription and unsubscription confirmation page, subscription and unsubscription message here. In Reports tab you can see the detailed reports of each campaign that you sent. To see detailed reports of the any email campaign or newsletter, just click on that campaign and it will display full report of that particular campaign. In that report you can see stats like Which Link on that email got most clicks, last 10 email opened users, last 10 unsubscribed users, last 10 bounced email, last 10 marked as spam users, which are all Country users opened your email. 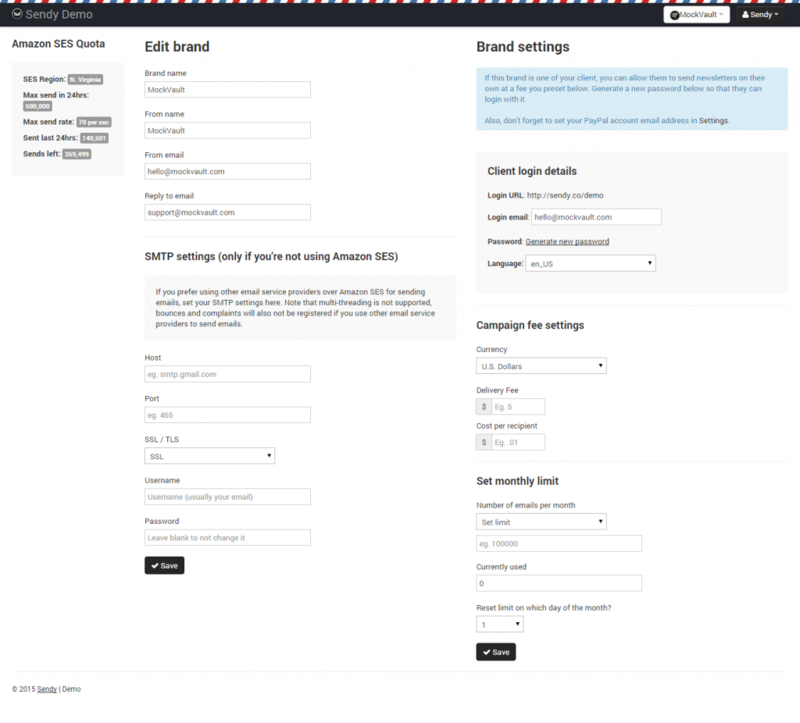 In “Create new Campaign” tab is the place where we are going to create new email campaign on sendy script. Currently Sendy newsletter script won’t come up with any newsletter template by default. So if you want to send any beautifully designed newsletter, then you have to do your research online to get the sendy newsletter template and use it here or else just send with bare design. Sendy supported essential html tags are listed below the page. Use the tags which are required on your email campaign. Don’t forget to add unsubscribe tag, because sendy won’t do this automatically. Currently sendy supports Plain text email and HTML email. But the thing is, sendy send or show plain text email only when user client won’t supports for HTML emails. 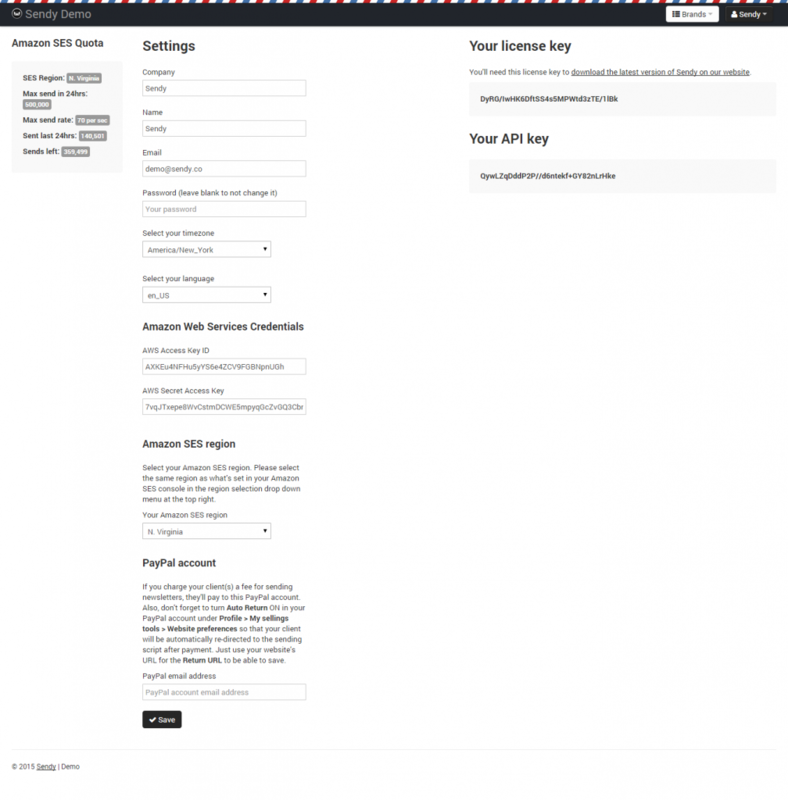 Under sendy settings here we will configure some mandatory sendy configuration like Adding amazon SES details like AWS Access Key ID, AWS Secret Access Key and your amazon SES region. If you are someone who have client and wish to receive to payments form clients, then you can add your Paypal email ID in this page. These are the features you currently get on sendy newsletter script. Sendy is an awesome script for email marketing. But it is really not for everyone. Because sendy uses Amazon SES service, which means all the newsletter you send should adhere to their policy or else you will be suspended or banned from using Amazon SES service. In general, if your planning to send “Buy this, Buy That” (only promotional or Spam sort mail) type of newsletter then its better to stay away from sendy. If you are someone who are offering valuable content to your subscriber then sendy will perfectly fit for your use case. Arun is the founder of PushIncome.com. I love building an online business. In this blog, I will share SEO, Affiliate marking, and other Internet Marketing Stuff. Wow, what an excellent post, thank you, thank you, thank you! I bought SENDY today because I wanted a better solution than the typical suspects; aweber, getresponse, mail chimp and the like. Those services are so overpriced in my opinion; I wanted to go a different route. There is a learning curve with SENDY, however I think in the long run it will be more than worth the effort. I could not find much of anything searching online for SENDY tutorials and the like. I am so happy I found your post. I was onto MyMail, and very disappointd to see here that bounce handling is faulty. Sendy seems interestting, but the lack of WP integration an d “No RSS to Email:” really turns me off. Any other one? I Still didn’t came across any better solution. Aweber work will for autoresponder, RSS feed (post delivery) but it’s costly. Do you think MyMail still can not handle bounce and complaints? MyMail is still in my mind. As i see they made some changes and improvements. What do you say brother? Sorry. I’m not using it. Better ask their support team itself. I was using sendy.co for a long time. Really wish they had all modern features that other platforms have like esend.io, mailchimp.com. A/B testing, segmentation, better reporting. I’ve been using Sendy for about 2 years now. It does all the basics and works well. The API unfortunately is VERY weak and I don’t see the developer making any additions to it any time soon. Well explained article about sendy. Very useful in understanding. I am about to purchase my copy.